On Tuesday, November 15, students involved with the New Sweat Free Campus Campaign at the University of California Santa Cruz posted clothing with anti-sweatshop messages around campus. 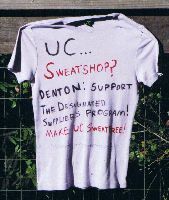 Their efforts were part of a national day of action aimed at increasing awareness about the use of sweatshop labor to produce collegiate apparel. The campaign, spearheaded by United Students Against Sweatshops, is demanding that university administrators back up their Codes of Conduct with an actual program of enforcement, the Designated Suppliers Program. These Codes of Conduct are official documents requiring that all university licensees have their goods made in factories that are not operated under sweat-shop conditions. Currently, while Presidents and Chancellors across the country are meeting with students and expressing interest in adopting this program, Chancellor Denton continues to stall meeting with UCSC students and refuses to take a stand on the issue. UCSC students and workers will continue to make sure that this campaign is at the forefront of campus issues and will not tire until the university makes a concrete commitment to guaranteeing that our clothing and uniforms are not produced in sweatshops.